Good value. Easy to put together. The instructions were a little difficult to decipher, but nothing that any quick build furniture expert couldn't eventually unravel. The cabinet itself is great! I didn't have a good place for litter in my new house, and with this I can put it almost anywhere. It keeps smells to a minimum (unless my cat is being a jerk and decides to not cover its poop) and looks great. 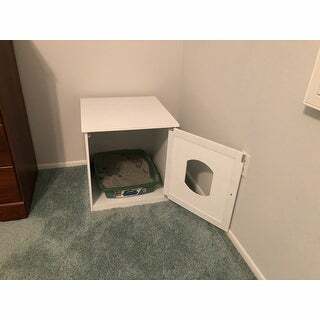 The door opens easily for me to clean the litter, and the opening is plenty big for my cats to get in but not so big that it ruins the point of the hideaway cabinet. Highly recommend to any cat owner! What I expected. A few problems with manufacturing/quality (holes not quite in right place, a few split corners on the edges), but an easy fix and not worth returning. The door wouldn’t quite close with my size litter box, so I leave the door open. It’s in a corner so the door doesn’t get on the way. My cat had no problem adjusting to the new “furniture” and a new room. Over all, a good purchase. 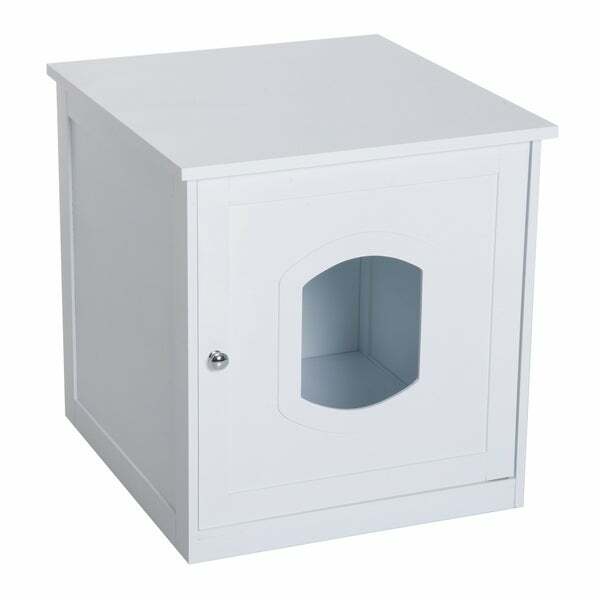 Great item to hide away the cat litter box. Love the sleek look of the finish. Easy to install, took me under 30 minutes. My cat loves the privacy and love sleeping on the top with her cat bed. I would recommended this item.